Yvan Muller takes the most from the fifth round of the WTCR – FIA World Touring Car Cup at the streets of Vila Real in Portugal. He won in Race 1, finished second in Race 2 and missed points in Race 3, taking the overall lead in the championship after fifteen races. Thanks to the bad start in Saturday’s first race, the four-time world champion in the #48 Hyundai i30 N TCR survived a horrific crash on the opening lap, initiated by a collision of two fastest qualifiers Rob Huff and Mehdi Bennani in Sebastien Loeb Racing’s Volkswagen Golfs. When the track was cleared of wrecked cars and debris, seven cars didn’t appeared on the grid when the race was restarted. Muller won the 13-lap race ahead of Esteban Guerrieri in the #86 Münnich Motorsport’s Honda Civic TCR. Campos Racing’s Pepe Oriola reached the third spot on a podium in the #74 Cupra TCR. In the second race, with reversed-grid start, Mato Homola scored his first points and maiden WTCR victory in the #70 DG Sport Competition Peugeot 308 TCR. 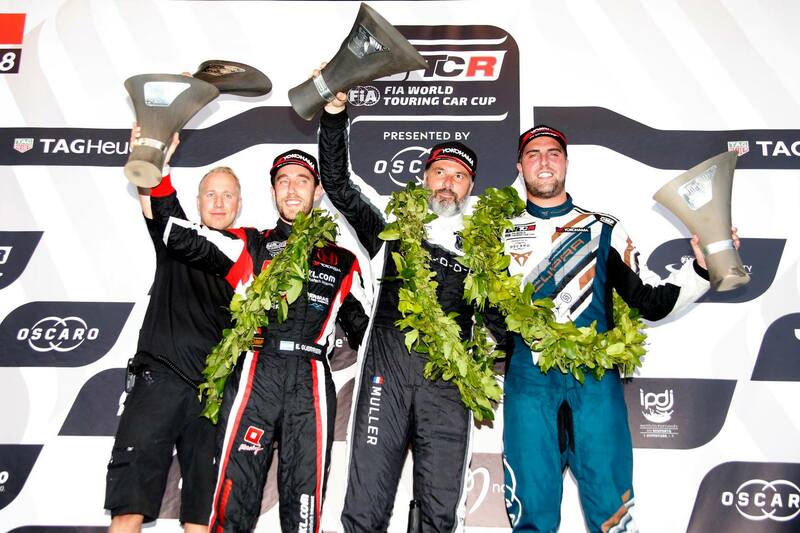 Yvan Muller and Pepe Oriola were on a podium again, taking P2 and P3. In the third race of the weekend, Thed Bjork started from pole position in the #11 Hyundai i30 to take one more victory for Yvan Muller Racing and his second win of the season. Two more Hyundai drivers, BRC Racing’s teammates Gabriele Tarquini and Norbert Michelisz, completed the podium in Race 3. Yvan Muller finished 11th in the third race, scoring no points, but he retained the lead in the championship. After fifteen races, he has 182 points, twenty-two more than Gabriele Tarquini and Yann Ehrlacher.